This is my second Ipsy bag that I’ve received and I’m feeling so-so about this months bag. Once again, I feel as though I’ve gotten my $10 back in products but did I really need this stuff? I’m pleased about three of the items but the other two I could do without. 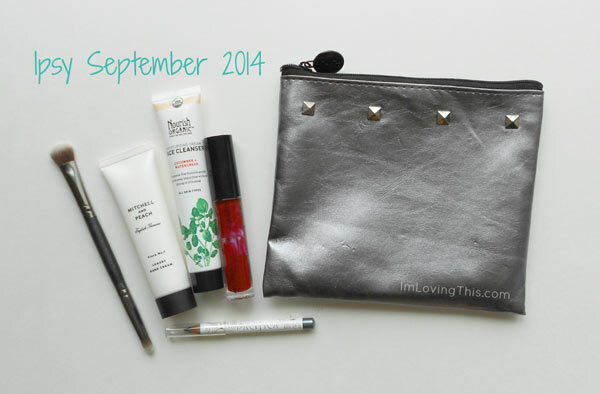 I like the makeup bag a lot better this month. I received a metallic silver bag embellished with four silver studs. I might add it to my donation box as I’m really not sure what I’d do with it. They are always way too small for me to use to keep my makeup in. Maybe I could keep hair ties and bobby pins in it when I travel or something? Ipsy is welcome to send me as many makeup brushes as they’d like. I feel like I can never have too many. This is a dual ended shadow brush, I’d prefer it to be only one-sided. I store my brushes in a jar and one end of this would be pointed down into my shells/sand. The brush is very soft and feels like it’s high quality. Mine has a bristle on it that is longer than the rest so I will have to cut that one down. I think that this brush will work great for blending eyeshadow and can’t wait to try it out. This brush retails for $17.50 on Crown Brush’s website. I haven’t tried it yet because I just received it but will update you on what I think of it. I love trying new skin care products so was excited to receive this one. It’s a good sized sample and I am going to be saving it for when I am traveling next month. I enjoy products that have cucumber as an ingredient and this face wash has cucumber, aloe vera and watercress. It says that it is fragrance-free, 100% natural USDA-certified organic, chemical free and cruelty free if that is something you are looking for in a product. I do however think it has a smell, maybe that is just the no fragrance soap smell, I wish it smelled like cucumbers. Will let you know what I like of this product once I test it out for a week or two, I feel like I could probably get two weeks out of this sample. The full size is 6 fl ounces and retails for $13.99, which doesn’t seem to bad. I was excited at first to receive this, as I opened it when it was dark and couldn’t see how much product was inside of the tube. Now that it is day light I can see that the lip gloss bottle is pretty much empty. I received the colour #08 Love Affair, which is a beautiful deep red. I actually really enjoy this colour and plan on wearing it during the fall and winter. I thought it was going to be a really bold colour on my lips but it isn’t very opaque, which I actually really like. I feel that it gives me just enough colour to brighten my look. It doesn’t have a scent and isn’t sticky which is a huge plus. I might just go and buy a full size of this after I finish this sample. Although I don’t know if I want to spend $19 on a lip gloss. Not too excited about this eyeliner, I received it in the colour gun metal. I really have no use for silver eyeliner, I actually received a silver liner in my Birchbox a few months back and haven’t touched it. This is a good sample size but honestly, I would prefer not to receive eyeliners unless they send me black, blue or purple. The full size retails for $11 and I’m not too sure if it is worth that. There’s plenty eyeliners at the drug store that are nicer. It says it is waterproof but it smudged off my hand with little to no effort. I might be able to use this as a base as it feels pretty creamy but it has quite a bit of sparkle in it. When I run it across my hand it goes on smooth but leaves clumps behind, so I can’t imagine that being a good look when you are trying to make your eyeliner precise and clean. Pacifica is 100% vegan, cruelty free and this product is formulated without parabens but there are better products out there. Overall, I wouldn’t recommend it, it would be a nice colour for a night out but again, it smudges off with no effort so it probably wouldn’t last all night. I’ve collected a bunch of hand creams from these subscription boxes and don’t know when I will ever get around to using them. I don’t like the smell of this hand cream but it feels nice. It’s very light and soaks right into my hands leaving them smooth. The tube I received is half the size of the full product which is a good sized sample, the full bottle retails for £17. It’s a nice hand cream, but there’s other ones I prefer more so I wouldn’t purchase this.